Californians live in a state of superlatives: our nation's oldest lake, the lowest point, and the tallest trees. California is one of the most diverse places on earth. There are approximately 30,000 species of insects, 63 freshwater fish species, 46 amphibians, 96 reptiles, 563 birds, 190 mammals, and more than 8,000 plants, many of which are found only in California. Within the state lines, California has huge variations in topography and climate, with dramatic mountain ranges, valleys, and deserts where distinct natural communities have evolved. These variations result in10 different bioregions each with its characteristic drainages, topography, climate, and habitat types. California harbors such a wide variety of habitats and species that it is recognized as a global biodiversity hotspot. Biodiversity is the diversity of life found at all hierarchical levels from genes, species, and communities to entire ecosystems. The term encompasses the complex functions and processes of natural systems. In California, this is exemplified by a wide variety of plants ranging in size from tiny mosses to giant redwoods. It includes all the different genetic stocks of salmon runs that depend on coastal watershed communities. California has the largest number of endemic species of any state. Endemic is a term that indicates a species is uniquely found within a specific geographic range. A species can be endemic to Solano County, like the Delta green ground beetle, which lives in Solano County and nowhere else on Earth. Another can be endemic to California, like the blue oak, which is widespread in California, but grows in none of the other 49 states or on other continents. A species can be endemic to the New World, like the puma and the jaguar. On the other hand, some taxa are cosmopolitan. For example, the bracken fern (Pteridium )can be found on all continents except Antarctica. In sum, endemic is usually used to refer to species that have limited geographic ranges. California contains a wide variety of topography and physical features that lead to variation in elevation, temperature, rainfall, and soil type and result in a high level of endemism. It is the diversity of these factors coupled with its large size that gives California 10 distinct bioregions. Most other states are far more homogeneous and hence encompass fewer bioregions. Minnesota, for example, has only 3 bioregions. Variability in soils, slope, aspect, temperature and topography has led to the evolution of endemic species with restricted ranges. This variability and associated endemism explains why human-induced disturbance may have broader implications for the flora and fauna of California. For example, when valley oak woodland is converted to a housing development, it can be difficult to find similar habitat nearby to substitute for what was lost. If the soils, slope, topography, temperature, and water availability are outside of the range tolerated by valley oak trees, then a valley oak woodland cannot be newly established. With valley oak woodlands occupying only a portion of their historical range, continued loss of these woodlands puts this natural community at risk. Learning more about valley oak woodlands and other endemic natural communities will help us better analyze the costs and benefits of decisions that impact California's biodiversity, and improve our ability to manage our state's land, water and biological resources. The global rate of species extinction is orders of magnitude higher today than it was before modern times. If the current rate of biodiversity loss continues, we will experience the most extreme extinction event of the past 65 million years. Land-use change is the primary driver of habitat loss and ecosystem degradation and it greatly exacerbates most of the other threats to the environment. Accelerated rates of land-use change are due to the fact that the world's human population has increased six fold since the 1800s, and the earth has been transformed to accommodate our rising consumption of natural resources. The Wildlife Conservation Society calculated that the human footprint is detectable across 83 percent of the land area in the world, excluding Antarctica. A good example of what can result from extensive land-use change is Southern California, where as much as 90% of the historic riparian habitat has been lost to agriculture, urban development, flood control, and other alterations. Synergistic effects between habitat loss, habitat fragmentation, and global warming can compound the effects of habitat loss on biodiversity. Researchers are trying to determine whether or not species will be able to shift their distributions or evolve new adaptations fast enough to survive climate change. Numerous studies document the historical movement of species as climate changed in the past, but habitat loss and the current unprecedented rate of climate change could make these historical processes of adaptation less applicable today. The expected loss of species due to continued land use change and global climate change will impact humans in part because we depend on the goods and services that natural ecosystems provide. Many of our medicines, food, and fiber, the basis for our economies and survival, come from plants and animals. Biodiversity and natural processes are also responsible for much of what we need to live on earth such as 1) maintaining air quality, soil productivity, and nutrient cycling; 2) moderating climate; 3) providing fresh water, food, and pollination services; 4) breaking down pollutants and waste; and 5) controlling parasites, and diseases. These ecosystems services are divided into three different types of services by scientists. Products obtained from species and ecosystems, such as food, fiber, energy, and fresh water are referred to as provisioning services; benefits obtained from ecosystem processes, such as the regulation of climate, water, and diseases are referred to as regulating services; and lastly but equally important are cultural services or the non-material benefits people obtain from nature such as spiritual enrichment, cognitive development, enjoyment, and aesthetic experiences. Some scientists quantify these types of ecosystem services in financial terms. One study estimated that the earth's biosphere provides 16 to 54 trillion U.S. dollars worth of services per year that we currently do not pay for. While quantifying these ecosystem services does enlighten people to the importance of natural systems in their daily life, it is difficult to quantify the entire value to humans of each of the 10 to 30 million species inhabiting the earth and all natural processes and ecosystem functions. The ecology of most species is unknown to us. Others play key roles in the functioning of natural communities and our own survival. For example, if it were not for a few kinds of micro-organisms that can digest chitin, the shed exoskeletons of arthropods would bury the surface of the Earth. While the interdependency of humans on other species and the ecosystem services that they provide people are important to recognize and provide strong justification for conservation, the intrinsic value of nature is equally important in motivating people to conserve resources and protect natural ecosystems. Habitat loss and extinction results in lost opportunities for personal inspiration and cultural enrichment, whether by bird watching, catching and releasing wild salmon, or simply enjoying a natural scenic view. To really improve as stewards of the earth, we need to acknowledge our interdependence with nature and our ethical and moral responsibility to prevent damage to the earth's systems. California, Hawaii and Florida lead the nation in number of endangered species. Typically one of five of the species you will come to know in California has been declared endangered, threatened, or "of special concern" by agencies of the state and federal governments. Some of these species are protected under the Federal and State Endangered Species Acts, which list species known to be in serious danger of becoming extinct and makes it illegal to take or harm these species through habitat loss or degradation. Humans have the intelligence to understand the impacts of our actions and change or modify our actions accordingly. The question is can people continue to prosper while simultaneously minimizing our impact on other species on which we depend? Can we learn to conserve the ecological communities that we value? It is imperative that we do so, and soon. What is a naturalist? Today we define naturalists as people who observe and study, and interpret the natural world. . Humans have always been scientists and natural historians by necessity. Just to survive we have had to observe, measure, speculate about and communicate about the world. Indigenous people lived, and in some areas still live, deeply aware of their surrounding ecosystems, relying on observing, knowing, harvesting, and teaching about nature for survival. Hence they are the quintessential naturalists. The recorded history of the human enterprise is full of questioning, argument and assertion about how the world operates. Every indigenous culture on earth has explored the geography and ecology of their local environment. The knowledge of indigenous peoples is often astonishing in its breadth, detail, and accuracy. The drive to explore, understand and utilize natural resources is a basic human trait. From the most seemingly depauperate oceanic atolls to the most diverse tropical rainforests, people around the world have discovered foods, medicines, poisons, and esthetic appeals in the ecosystems they inhabit. That is the crux of being a naturalist: to observe the world, to report back to your fellow humans, and to protect the natural world. "We had many relatives and we all had to live together, so we'd better learn how to get along with each other. She (my mother) said it wasn't too hard to do. It was just like taking care of your younger brother or sister. You got to know them, find out what they like and what made them cry, so you'd know what to do. If you took good care of them, you didn't have to work as hard. Sounds like it is not true but it is. When that baby gets to be a man or woman, they are going to help you out. You know, I thought she was talking about us Indians and how we are supposed to get along. I found out later by my older sister that mother wasn't just talking about Indians, but the plants, animals, birds-everything on this earth. They are our relatives and we better know how to act around them or they'll get after us." There are many ways of learning about the world, many ways of talking about the world, and many ways of thinking about the world. The Western scientific approach, where possible explanations for observations are proposed and then tested against evidence, is one way of increasing knowledge. Native peoples who have extensive experience of a place may use very different ways of gaining and passing on knowledge. Native peoples all over the globe are expert naturalists with remarkable observations and insight into the natural processes, habitats, and organisms with whom they share a long history. The same is true of California native peoples who have 10,000 or more years of experience observing, talking about, and depending on California's flora and fauna. In Western tradition, knowledge is passed from generation to generation using the written word, often supplemented with images (drawings, paintings, photographs). Native Americans traditionally passed knowledge from generation to generation experientially and orally. A mother would take her daughter out to dig roots for basket making. The daughter would be in the habitat, feel the sand, sweat in the heat of the day, and struggle to pull the roots up. The mother might also talk about the activity, give verbal instruction about technique, or pass on customary knowledge associated with the experience. The words the daughter heard might be in the form of literal information or in a metaphoric form: a story, a song, a recollection, or a myth. The Pomo say that designs for baskets and other instructions are often transmitted through shared dreams. The experiences and observations contained in what is called traditional ecological knowledge represent a wealth of information. Native Americans accumulated information about what plants and animals could be eaten, when they were available for harvest, how they varied from season to season, as well as how to collect and process them. Native Americans passed along detailed ideas for habitat management, especially regarding the use of fire as a management tool to promote habitat diversity, and to encourage the production of useful animals and plants. The legacy of Traditional Ecological Knowledge includes observations and ideas which correspond neatly with western knowledge, and may contain ideas or observations outside the realm of Western thought. Traditional cultures often emphasize the interconnected relationships between humans and the natural world. In part this is because traditional foods and cultural practices rely on natural products that often can only be harvested from intact natural communities. Practices that tie people to the land form the basis for a strong sense of place and responsibility for the world around us. Plants, animals, and physical factors such as water and mountains are not seen as mere commodities for human use, but as sacred. Since nature has spirit, using natural resources was more of an exchange, so their philosophy was to take only what was needed and to honor what was taken. Many tribes have ceremonies, dances, and songs dedicated to the earth's spirit that provides a bounty of acorns, strawberries and salmon. The way that native people obtain goods and use services provided by ecosystems was often more sustainable than the way Western cultures tend to exploit natural resources. There are many examples of native Californians managing nature to be more productive Examples are distributing bulbs while harvesting, and plucking grasses rather than uprooting them. This demonstrates another important lesson from native people, which is that managing natural resources can help preserve them for future generations. Ancient practices have proven to be beneficial today for native plant restoration and regeneration efforts to enhance biodiversity across many habitat types. After all, California Indians have been nurturing native plants for thousands of years. The long history of native people in California had an important role in shaping the natural communities we see today. The use of fire is one area where Native Americans in California had a highly developed and nuanced understanding. Native Californians used fire to drive and concentrate game, to open paths for travel, to alter habitat mosaics, to protect against enemies, to safeguard villages from fire, as well as to promote the growth of desirable plants and to stimulate the production of specific plant parts. The Pomo burned certain chaparral stands to stimulate coppice growth (resprouting) of redbud (Cercis occidentalis). This resulted in the new growth of long redbud stems which were valued for design elements in Pomo coiled baskets. It is important to keep in mind that native Californians represent a huge variety of culture and language stemming from five hundred relatively small tribal groups. Once again California trumps many other places with its diversity - in this case, historical cultural diversity. Even groups with the same name often varied widely. For example, the Pomo spoke at least seven distinct languages that are thought to share a common origin. In addition to this incredible diversity, California also supported the highest density of native people north of Mexico in pre-Columbian times. The rapid and devastating loss of the 300,000 or more California Indians started in 1769 with the first Spanish colonists and accelerated as the missions were established and westerners arrived seeking timber, gold, and fertile farmland; and at the same time bringing new diseases to the region. The existing scholarship, artifacts, and overall body of work that we have to draw on cannot possibly capture all we would like to know about this rich history. Thanks to the efforts of many California tribes, today many important traditions and practices survive within native communities. Though this book takes a Western scientific approach to looking at California natural history, we draw inspiration from traditional ecological knowledge and the reverence for natural processes that are embodied in that tradition. Naturalists are generalists in the best sense -- cross-disciplinary, with knowledge of a system as a whole, not just the pieces. In the 18th and 19th centuries, before the formal fields of ecology, entomology, geology, zoology and others emerged, it was naturalists who undertook these sciences. They collected specimens, recorded their observations and became experts in a certain habitat or species. Their work and collections were central to the origins of natural history museums and to the development of the theoretical underpinnings of current scientific thought. This connection is still vital today; naturalists form a key link between common and scientific understanding. By becoming a naturalist, you are taking a place in an important tradition of knowledge keepers. Naturalists make the world accessible to all and bring out our interest in and wonder at nature. One of the most notable naturalists, Charles Darwin, changed the field of science. Using data from his own observations and experiments, as well as information garnered from his voracious reading, Darwin described the process of evolution by natural selection which remains the greatest explanatory tool of the biological sciences. Others, such as John Muir and Rachel Carson, wrote essays that changed our views of nature and inspired their readership to protect the environment. John Muir is the quintessential California Naturalist. Muir possessed the two key qualities vital to any naturalist: the power of careful observation and the ability to communicate and inspire others. From his extensive time in wilderness he had a full appreciation for the interconnectedness of nature and noted that "When we try to pick out anything by itself, we find it hitched to everything else in the universe." Muir is best known for his fight to prevent the damming of Hetch Hetchy Valley; his efforts to protect Yosemite Valley, Sequoia Kings Canyon, the Grand Canyon and Mt. Rainieras National Parks; and the founding of the Sierra Club. However, those activities were only a part of his life work. Muir loved to roam the mountains, drawing and making notes as he went. He authored several books about the geology and natural history of the Sierra Nevada, turning his observations into writings that stirred people to visit and protect wild areas. Though he only had a few college classes in geology and botany, he was among the first people to recognize that Yosemite Valley was formed by glacial action, a conclusion he arrived at through his intimate acquaintance with the area. Rachel Carson was a biologist and natural history writer. She was one of the first women to be hired by the US Bureau of Fisheries as a professional biologist. During and after her career with the Bureau, Carson wrote numerous award-winning books and articles about the natural world. Her book Silent Spring brought attention to the damage caused by pesticide use, awakened the public to the severe consequences of environmental contamination, and ultimately influenced public policy. While indigenous people and early explorers created the foundation of what we know today, there is still a lot to explore and discover about the natural world. Describing what you observe is an important part of discovery and keeping a naturalist journalis one of the best ways to learn. A journal is a place to note your experiences, frame your questions, and check your facts. The best naturalists, like Darwin and Lewis and Clark, have all kept journals that we value highly today for the insights that they provide into the thoughts and experiences of our ancestors. If Columbus hadn't written it down, we would have no way of knowing which island he actually landed on, what the people living there were like, or how long he lingered. Meriwether Lewis is famous for the maps he included in his journal which make it possible for us today to accurately retrace the progress of the first transcontinental expedition, and even pinpoint many of their camp sites and the places where significant events occurred. Simple things like noting the first lilac bloom in your yard allows you to check next year when your friend mentions that the lilacs are blooming early (or late) this year. Thoreau's journal entries on blooming times of flowers around Walden Pond are proving to be useful to climate scientists today. Journaling is a way of setting aside time to put your thoughts in order, to frame your experience, help you share with others, and to prompt you to be exact in your observations. One reason for keeping a naturalist journal is that it emphasizes and explicitly values your own experience. It is a place to say "today I saw the first eastern kingbird of my life!" Every time you venture out into the natural world you will have many experiences, at least some of which may be interesting or new to you. If so, write them down. It is critical that you value your own experience. It doesn't matter how many people before you have seen an eastern kingbird. In fact, it is not only the first time you see something that it is special. Every time you see a hummingbird visit a paintbrush flower it is special, ifyou imbue it with value. Many people like to draw in their journals. Try taking a few colored pencils along to draw a particularly appealing moss or the pattern of facial stripes on a bird. Drawing can be a wonderful way to encourage yourself to slow down, to take the time to observe nature more closely. So, let your journal be your own. Interact with your journal in whatever way appeals to you and expresses who you are. Share it with whomever you think is appropriate, or with no one if that is your preference. But do try using this tool to sharpen your skills of observation and interpretation. We recommend using a variation of the Grinnell Methodthat emphasizes the collection and organization of field observations for scientific investigation. This method was developed by Joseph Grinnell (1877-1939), a noted field biologist and the first director of UC Berkeley's Museum of Vertebrate Zoology. For over a century, field biology and natural history students at UC Berkeley have been trained in this method and it is probably the method most used by professional naturalists. While we recommend this general format because it provides a good framework for making and recording observations, don't lose sight of the fact that this is your journal - over time you may modify or develop new techniques that work best for you. The important point is to record detailed observations. Below are guidelines on how to keep a field notebook and a journal based on the Grinnell Method. This is actually what you will need in the field for recording your observations. The notebook can be spiral or hard bound, the format is flexible. It often helps to have an "Observation Checklist" in your notebook (either the first or last page) that you can reference for your notes. This information will often make up the first part of the written description in your field journal. Species, rocks, or other natural events seen. Some naturalists choose to also keep a journal where they rewrite their field observations from the field notebook in a format that is easy for you and others to read. Each field day should have a separate journal entry that should have a written descriptionof the day's observations (including a species list, maps, drawings, etc.). A species account (if any), and a catalogof collected specimens (if any) will also be included with the day's entry. Here are some specific points that can help format a journal. Number all pages - this often goes in the upper right on the page. Written description - This is a general account of the day's events including where you went, the conditions, what you saw and any additional thoughts or comments. Begin each page with the location of that day's observation. This should be underlined with a wavy line. Write in full sentences and narrate what you observed. Only write on one side of a sheet. Use the opposing page for sketches, maps, or photos (taped onto the page). Underline species names. Use straight lines for scientific names (Genus species) and wavy lines for common names (this helps in scanning your journal for observations). Compile a species list at the end of the written description of the day's events. It is helpful to have different categories (e.g. birds, plants in flower, rocks, etc.). Include maps (pasted into your journal or drawn) that show locations of your route and/or activities. Species account - this is a record of specific nature observations of interest, usually in a single place and pertaining to the ecology or behavior of a specific species, although this could really apply to any natural phenomena (e.g. weather, rock formations, wave action, etc.). Each account starts with the name of the species. Catalog - this is a record of any specimens that you collect. Make sure to label or tag each specimen you collect with the following information: 1) Catalog number; 2) Date collected; 3) Collection location 4) Collector's name; 5) Identification. The scientific community has developed a language all its own to clearly and accurately identify organisms. With 250,000 kinds of plants on Earth we can't simply refer to the one we want to discuss as "that tree." The problem is even more overwhelming with insects, where the numbers grow truly phenomenal. The number of insects that have been described by scientists is around 750,000, and these are just the ones we have identified. The actual number of insects on earth is estimated to be between five and ten million! In order to communicate clearly about this number of organisms a special set of terms was developed. Using a unique scientific name for each species allows people from all over the world to refer to the same species by the same name. This is not the case for common names that are often employed. With all the variations in native California languages there were many words applied to the same animal, for example. The raccoon (Procyon lotor) was referred to as kahdoos by some Pomo people and hoo-ma-ka by the Coast Miwok.Likewise we use cat in English and gato in Spanish but Spanish and English speakers can be sure they are referring to the same animal when they use Felis catus. The system scientists have devised is elegant in its simplicity and formality. It is based on the classification system created by Carl Linnaeus (1707-1778). Linnaeus was one of the first people to attempt to list all the plants and animals known at the time, to give each a unique name, and to attempt to classify them in a coherent manner. At the time of Linnaeus, Latin was the language that scientists used to communicate with one another across the globe, so Linnaeus and his contemporaries used Latin when classifying species. This tradition carries through today as scientists continue to use Greek or Latin for genus and species names. Each species is assigned a two-part name, a binomial. The first word of the binomial designates the genus to which the organism has been assigned, while the second designates the species. People are familiar with binomials, whether they realize it or not. Tyrannosaurus rex is a binomial designating a large, extinct carnivore. Tyrannosaurus is the genus name and the first half of a binomial, and the second half is rex -- the species name. Many of the scientific names designating organisms have made it into popular usage, although the majority have not. One of the useful aspects of this naming system is that each organism has been assigned a unique binomial. Thus we are Homo sapiens, which translates to knowing man, the black rat is Rattus rattus, and the house cat is Felis domesticus. Each has a unique binomial. One of the great advantages of this "scientific" naming system is it reflects relationship among species. Felis domesticus is not the only member of the genus Felis. In fact, the genus Felis is global in distribution and contains about 28 species. The fact that all have been assigned to the genus Felis indicates that the people who have studied the relationships of the mammals think that all 28 species of Felis share a recent common ancestor and thus can be considered closely related. The same is true for their prey the rats which total to 64 extant species with the best known being the black rat and the brown rat (Rattus norvegicus). The most recent addition to the list is the largest of the rats. In 2009, scientists discovered what may be the largest rat species in a remote rainforest in Papua New Guinea. The highest taxonomic level, the Kingdom Animalia, includes all "animals", but not plants, bacteria or viruses. The Phylum Chordata includes all animals with backbones, but excludes invertebrates like insects, spiders and clams. The Class Mammalia includes all animals with backbones that have hair, feed young with milk and are warm blooded, but excludes other cordates (animals with backbones) like birds and amphibians. The Order Rodentia includes mice, rats, squirrels, porcupines, beavers, guinea pigs, and hamsters - all have continuously growing front teeth in the upper and lower jaws that are kept short by use. The Family Muridae includes all the old world rats and mice. The genus Rattus contains the closely related rat species. Finally, the binomial Rattus norvegicus designates uniquely one species of brown rat, sometimes referred to as the Norwegian sewer rat, and excludes its close relative the black rat. . Some species have been further divided into multiple sub-species to allow scientists to distinguish differences between similar groups of individuals within one species. Sub-species can usually interbreed and produce viable offspring. An example of two you know is Canus lupis familiaris, the domestic dog, and the Australian dingo Canus lupis dingo. These two types of dogs readily bread with one another but have distinct physical characteristics that scientists deduced warranted sub-species designations. The gray wolf is also Canis lupis, which tells us how closely, related domestic dogs and wolves are - no surprise they can successful interbreed. So, when referring to a particular sub-species it is important to refer to the genus and species names followed by the sub-species name. Using this system, you may begin to develop a mental map of the relationships of organisms. This is an incredibly useful exercise for thinking about how evolution shapes the species and their relationships to one another.. For example at the family level you can see that peaches, apples and pears are all closely related together, and that pine trees and oaks are very different from them! Classifying species is just one of the tools that naturalists and scientists use to conceptualize and communicate about the natural world. Each species has tolerance limits beyond which they are not able to live. These tolerances are dynamic and can change with time and conditions. The terms below describe environmental conditions that influence the distribution of species and habitats. They may be familiar, but their use for naturalists takes on a specialized meaning. Geographic range is the area within which a given species can be found. However, geographic ranges are not static. Plant and animal species shift their ranges over time. They are constantly probing the boundaries of their range to see if it can be expanded. Geographic ranges also change as climate and topography change. The determining factors that dictate where a species of plant can grow are things like soil, aspect, topography, position on the slope, elevation, rainfall, wind, temperature, distance from the coast, and the size of the surrounding plants. The same is true for many animal species whose distributions are limited by environmental conditions as well. Topography, wind, and distance from the coast all play a role in whether a plant is able to grow in a certain place or not. Think of the Coast Range of California as a wall blocking the flow of air from of the Pacific Ocean toward the Central Valley. The lowest gap in the wall is the Golden Gate, and that is the first place air (wind) pushes through the Coast Range to reach the Central Valley. This gap allows cool, moist Pacific air to move inland daily, bringing moisture and lowering temperature everywhere it penetrates. Contrast this with the imposing wall of hills along the Big Sur coast, extending from Monterey to Morro Bay. This range of hills (the Santa Lucia range) effectively blocks the flow of cool moist Pacific air from reaching inland. As a result, at Vallejo, 30 miles inland from the gap between San Francisco and Marin, the temperature at 6 PM in July might be 55 degrees and the relative humidity 80%, while 30 miles inland from the Big Sur coast the temperature might be 82 degrees and the relative humidity hovering at 17%. These are very different conditions for plants and animals to cope with. Aspect generally refers to orientation, or the direction that a slope faces. Imagine a big isolated hill, Mt. Diablo for instance, which has four sides that face north, east, south and west. Each side of the hill will be exposed to the sun for different portions of the day, and different parts of the year. Here in the northern hemisphere, the sun shines from the south, so south facing slopes are hotter and dryer than north facing slopes. It is typical in coastal California for cool, moist north facing slopes to support more conifer trees (e.g. redwood, Douglas-fir), while hot, dry south facing slopes are often covered in oaks or chaparral. A similar, though less intense distinction can be drawn between east and west facing slopes. Closely related to aspect is slope. Slope is a measure of steepness, with vertical (90 degrees) being one extreme and flat (0 degrees) being the other. Most hills vary between 15% and 30% slope. The flats at the base of the hill collect soils washed off of the hill by landslides and streams, so soils on slopes tend to be shallower and rockier than soils on flats. Plant communities will differ depending on where on the slope the community is located from the flats at the base, to the steep mid-slope, to the gentle, rounded top of a hill. Air flow up and down hills varies with the topography and also shapes natural communities. In general, warm air rises, while cold air sinks. Thus, during the day, especially in the afternoon, wind tends to blow up canyons, while cool air tends to flow down canyons at night. This can be quite pronounced, and temperatures at the base of a hill can be very different from those at midslope or at the summit. Cool air tends to pool at the base of hills, causing valleys to be covered in frost while the hills around the valley may be frost-free. Temperature and rainfall, as well as the seasonal distribution of these factors, are huge influences in determining plant and animal distributions on biogeograph. It is not the averages, but the extremes that generally determine geographic ranges. Imagine a plant that can tolerate 35F or 2C degrees, but is killed when the temperature dips below freezing. It doesn't matter if the weather is balmy and warm most of the time. If the mercury dips below freezing one day per year in a specific valley, that plant will be excluded from the site. The same can be imagined on a multiyear scale. Suppose you have a run of 20 "good" years, where the temperature never dips below freezing, but every 20th year the temperature drops to 17 degrees. Our hypothetical plant will still be excluded. We are all familiar with this phenomenon because we hear news reports every seven or eight years of the citrus crop in Florida or California being wiped out by a cold snap. Occasional cold snaps interrupt fruit production in oranges and grapefruits. Even more extreme, every 20 to 50 years we hear about the citrus trees themselves being killed. Citrus growers push the limits of the temperature tolerance of the trees they cultivate, and periodically they pay the price. Topography also plays a determining role on temperature and rainfall. As clouds are pushed up a slope their temperature drops. As the temperature in the cloud drops, its ability to carry water is diminished. The reduced capacity is noticed on the ground as rainfall. When clouds are pushed off of the Pacific and up the slope of coastal mountains they tend to drop moisture. An extreme example of this is that clouds passing over the low topography of San Francisco are not pushed upward, and so are not wrung of moisture, and the annual rainfall in San Francisco is about 20 inches. A few miles to the north the same clouds intersect Mount Tamalpais, are driven up 2,000 or more feet, and dump their moisture in such a dramatic way that Kentfield has 60 inches of annual rainfall, three times that of nearby San Francisco! As you can imagine, the plant communities that grow in the two areas are quite different. Soils have different chemical compositions and physical structures depending on their parent materials, and how and where they were formed. Granite, of which most of the Sierra Nevada is composed, forms very different soils than the volcanic soils around the base of Mt. Shasta. Both of these soil types are chemically and physically distinct from the serpentine soils of the Klamath Range. Plants respond to these differences, and soil chemistry is a primary determinant of plant community composition. The leather oak (Quercus durata) is a reasonably good indicator of serpentine soils. Leather oak grows only on serpentine soils, though certainly not on all serpentine soils. Thus, geologists looking for serpentine soils can drive along looking for leather oaks as a first indication of serpentine soils. Learning about the world never ends. Every year, new plants (including huge trees! ), insects, birds and mammals are "discovered." These species are "new to science." But an equally interesting category is "new to you." Take time to notice something around you, bird song, trees planted in your neighborhood park, and native bees visiting your sunflowers. These experiences offer opportunities close at hand for enriching your life, and deepening your understanding of the natural world. While outside observing nature pay special attention to current weather conditions, regional climate patterns, topography, and soil as these factors may explain in part which species you see and the composition of surrounding plant and animal communities. Conversely, the plants and animals that you observe can tell you a lot about the physical conditions such as the climate and soils. Sight, sound, smell and touch, when safe and appropriate, can all provide valuable clues about the nature of a species. Sometimes even taste can be included in your exploration. Spend 10 minutes every day or a half hour once a week outside at the same spot just observing=. Change the time that you go if possible to observe differences between morning and evening. Write down what you see: birds, plants, insects, flowers, and the condition of trees or a creek. Begin the first session by simply walking its perimeter and noting its contours and boundaries, and making a simple map of the landscape and important features within it (large trees, structures, streams, fences, etc.). Over time you will deepend your understanding of how nature works. The best is to choose a safe place that's easy to get to so you make sure to visit it often. Nature journals are a time honored tradition among naturalists and explorers. They can be simple, like a small spiral notebook with quick notes in it, or elaborate affairs with drawings and specimens pressed into them. Whatever kind you choose, remember to include the date, time, location and weather with each entry. So many amazing naturalists have preceded us and they can provide inspiration for our own endeavors. Think of a naturalist you admire. Research him or her and read some of their journal entries. Then write down some of the qualities and skills you admire about that person in your journal (e.g. "Can distinguish metamorphic rocks from sedimentary and is comfortable tramping around outside in the snow."). Which of these qualities and skills do you already posses? Which would you like to acquire? Make a list and check it in six months. Which qualities and skills have you gained? The California Naturalist Handbook provides a fun, science-based introduction to California’s natural history with an emphasis on observation, discovery, communication, stewardship and conservation. 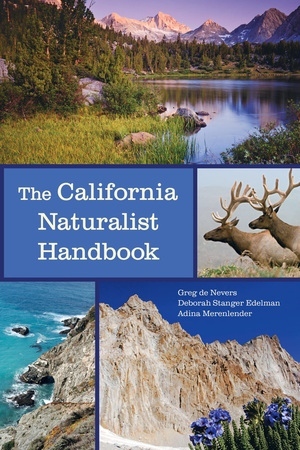 It is a hands-on guide to learning about the natural environment of California. Subjects covered include California natural history and geology, native plants and animals, California’s freshwater resources and ecosystems, forest and rangeland resources, conservation biology, and the effects of global warming on California’s natural communities. 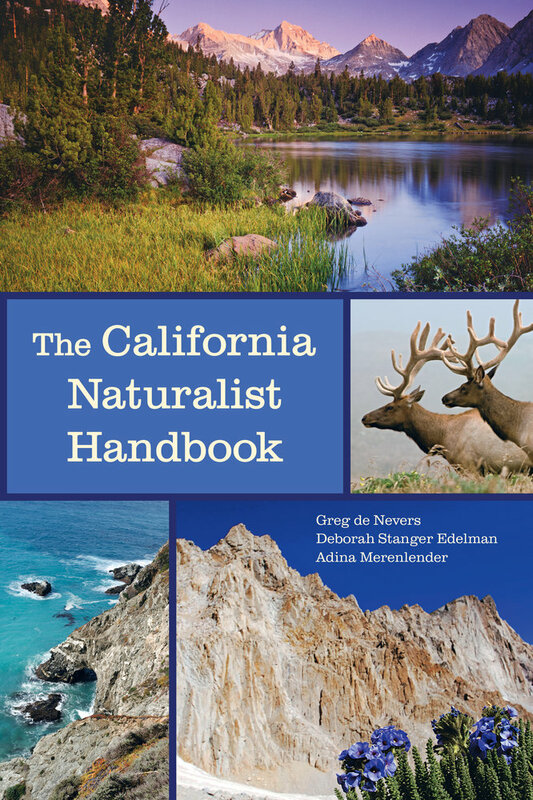 The Handbook also discusses how to create and use a field notebook, natural resource interpretation, citizen science, and collaborative conservation and serves as the primary text for the California Naturalist Program. Greg de Nevers is a botanist and naturalist with years of experience observing nature and sharing it with others through writing and teaching. Currently, he is a high school science teacher. Deborah Stanger Edelman co-founded the California Naturalist Program and has over 20 years experience developing resource conservation and education programs for organizations including the Golden Gate National Parks Conservancy, the Mendocino County Resource Conservation District and the University of California Cooperative Extension. She has an M.S. in Ecology from the University of California at Davis.